Frederick Williamson's striking wooden bowls are made from sections of fallen trees, most from within a 30-mile radius of his home in Crozet, Virginia. He has been a woodworker since 1971 and his creations have been displayed in galleries in and around Virginia. This is the first exhibition of his work in Rappahannock County. forms, while in others qualities of humans and animals are combined. 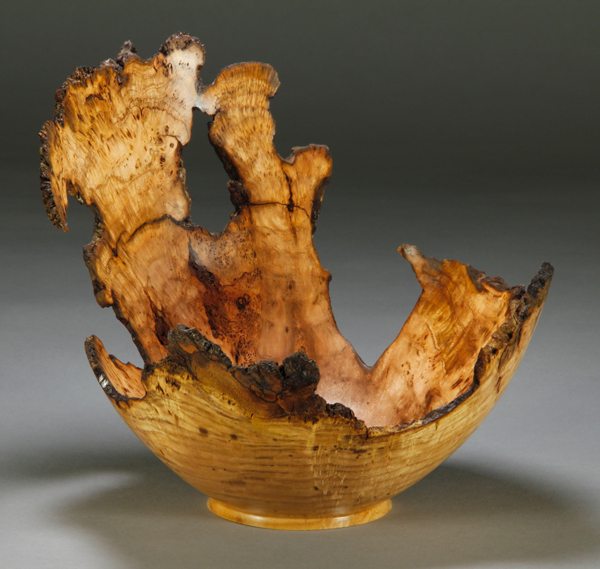 "Turning bowls straight from the log allows me to bring out the beauty of wood with much artistic spontaneity. I love to work with local trees felled by storm, disease, or old age. Most logs are from within a 30 mile radius of my home. There is a strong element of the found object as I search the roadways and friends’ woodpiles for interesting pieces. People will call me about a tree that came down at their home, perhaps wanting a bowl to preserve memories. Polished smooth and dried to a stabilized state, the thin arcs of the wood display the character and history of the tree, bringing out the inherent beauty of figure and grain which the finish brings to life. The whole process preserves a bit of the soul of the tree. Each of my bowls begins as a chosen section of log, chain-sawn to rough size, and screwed onto the faceplate of my homemade lathe. 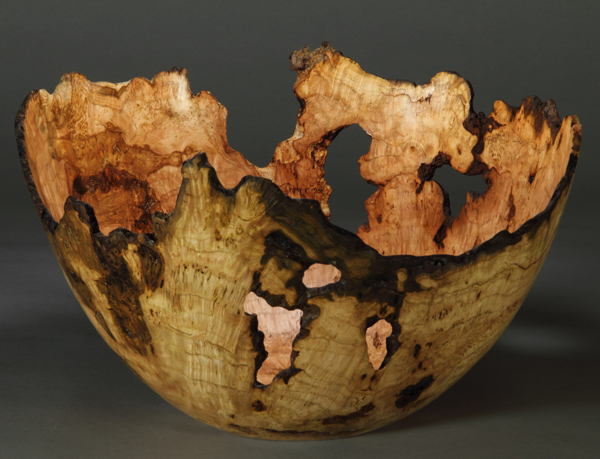 Peculiar details such as grain, color, texture, knots, burls, ant holes, or spalting often determine the final shape. Those traits are my palette and my glazes, with a clear finish used to bring out the natural color of the wood. Because my bowls are turned thin, they warp rather than crack as they dry to their final state. None is perfectly round, and each is unique. Much risk is involved, since what is cut off can’t be replaced. It takes concentration, strength, patience, and tolerance of showers of shavings to complete a piece and be rewarded by the bowl’s glow when the oil is applied. Woodworking has been my passion and my profession since 1971. Much of my lifestyle is homemade or homegrown, from tools, to the house we live in, to the apple cider press. I work alone in my shop, surrounded by the beauty of Sugar Hollow in the foothills of the Shenandoah Mountains. My family and I try to live close to the land and close to the seasons. Maple, cherry, walnut, oak, ash, apple, peach, poplar … there is so much variety growing in our area. May the fruits of my handiwork give you pleasure."